Contest you might want to try. Submit published or unpublished work. $5,000 in prizes. For this contest, a story is any short work of fiction, and an essay is any short work of nonfiction. Judge: Dennis Norris II, assisted by Lauren Singer Ledoux. Please submit as many entries as you like. All themes accepted. 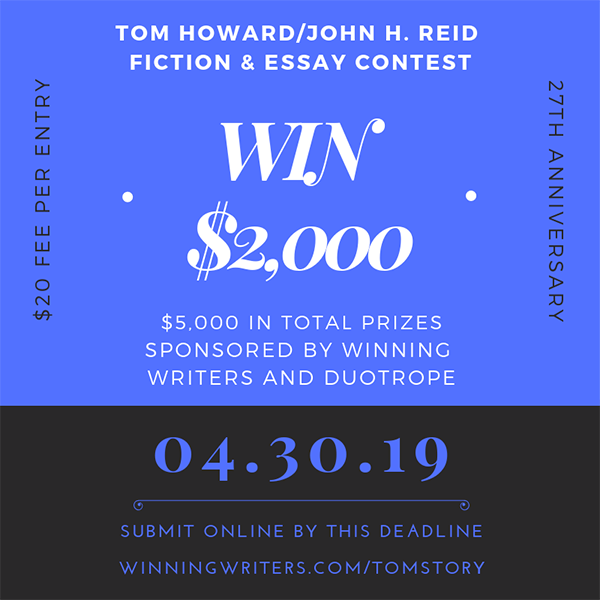 Entries may be published or unpublished. Length limit: 6,000 words maximum. No restrictions on age or country. Please click the Submittable button below for full details. Fee: $20 per entry. Read the winning entries from the 26th contest.The results of our 27th contest will be announced on October 15, 2019. REMINDER: PB CONTEST FOR WRITER’S WHO HAVE NOT HAD A PUBLISHED PICTURE BOOK IN THE LAST THREE YEARS or a COMPLETELY UNPUBLISHED AUTHOR. DEADLINE APRIL 1ST.